Which lead me on to thinking about garments. My mind pondered the options, and I mused on yokes. The incredible palette of Felted Tweed shades was still firmly imprinted on my mind, following working on my Nut-Hap for The Book of Haps (see below for a purchasing link). This time the colours wandered on from birds, to their habitats. We adore muddy woodland walks! There are some fantastic places for a good Sunday afternoon leg-stretch around here: Alfred's Tower, Vallis Vale and out at East Woodlands. On my way home from an inspiring stay with Kate in Scotland, I sketched up the sweater I wanted. I don't often draw my ideas, as I'm a bit rubbish at it, but on this occasion not only did I sketch it, but I even coloured it in. It helped me to crystallise the look I was aiming for: A long-line sweater to keep my hips warm on damp autumn days. 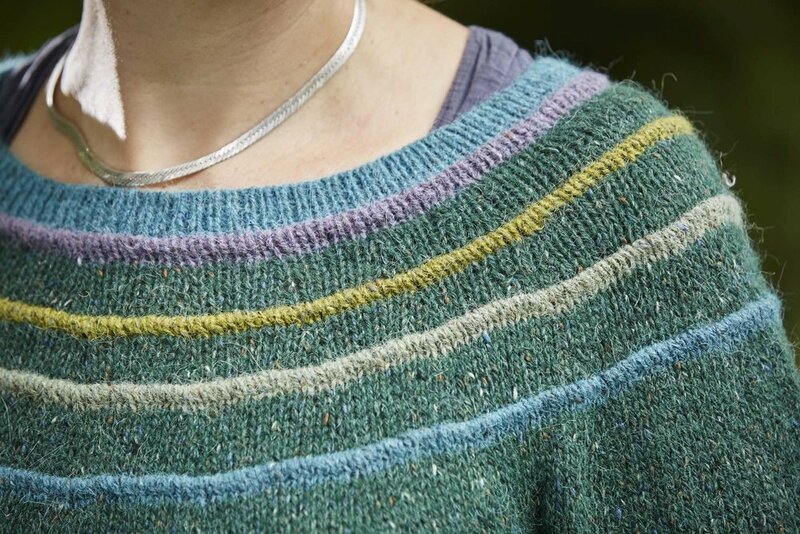 Bands of colourful tucks around the yoke, and some short-row shaping to raise the back neck. Having rifled through my stash of Rowan Felted Tweed, I settled on a combination of watery blue for cuffs, neck and hem, with greens and a purple which spoke of leaves and the peeping out of woodland flowers. The background colour is Pine - a gorgeous deep green that sits brilliantly with the other shades, thanks to the multitude of tweed flecks of different colours. My incredibly brilliant friend and sample knitter, Kim helped out with the knitting as I was swamped with other projects, and before we knew it, the sweater was complete. We chose to photograph it out in the picturesque village of East Woodlands, just outside Frome. There is some wonderful deciduous woodland, just adjacent to the village church of St Katharine's, and despite the pouring rain, Jesse Wild captured exactly the woody feel I was hoping for! We've already published a series of video tutorials over on our YouTube channel, that will assist you in working the tubular cast on, and various tuck techniques, and they are explained in full in the pattern instructions. The pattern has also been tech edited by Jim (VeufTricot). You can purchase the pattern over on Ravelry for £5.50, and as a thank you for your loyalty, if you have previously purchased at least one of my patterns, you will automatically receive a 25% discount on the pattern price (this should show up in the pattern basket, no code required). The loyalty offer ends two weeks today, on Thursday 13th October 2016.